In case you haven't already drunk too much this Bank Holiday Weekend, the Atlas, in Fulham, is a pretty little pub a stones throw from West Brompton Tube and the back end of the Earls Court Exhibition Centre. A Victorian pub, which apparently reopened in June 1998 as a gastropub, it is thankfully not gone further down the restaurant route than offering good food, and has kept its pub atmosphere and a good range of drinks and snacks. 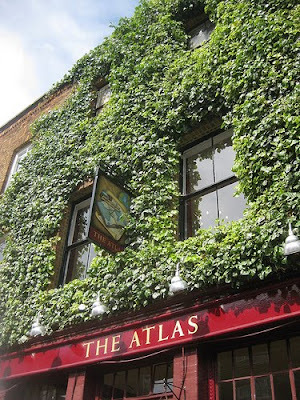 Your author spent a very pleasant evening at the Atlas on Saturday, and enjoyed the good range of boardgames, and especially a gripping pack of British trivia cards. Fajne zdjęcie tego The Atlas, lubię takie budynki zarośnięte bluszczem.